There are a lot of companies currently making 1911 pistols. Industry insiders tell me it is easier to manufacture a proven design than it is to go through the time and expense to create something new. The Unertl Concealed Carry Pistol is a classic Commander-size 1911 with all the right features. And it's a totally "made in the USA" handgun. This is OK, as the 1911 has certainly proven itself when lives are on the line. It makes sense to go with something you know will work if you must rely on it when going into potential danger. For this same reason, I don't mind paying more if the added expense is justified. The truth is, I put no price tag on my life, and I am willing to spend whatever it takes to give me the kit I need not to just survive but to prevail. You know, to win. Bill Jordan said it many years ago: There is no second-place winner. In a gunfight, second place is either hurt or dead. No price can be put on one's ability to win. And while it is true that no particular piece of gear can assure victory, top-quality gear sure helps. Unertl, a company known for many years for its high-end sporting and tactical scopes, is one of the new faces in what I call the "1911 wars." It offers a small line of high-grade, custom-level 1911 pistols intended for defensive use. 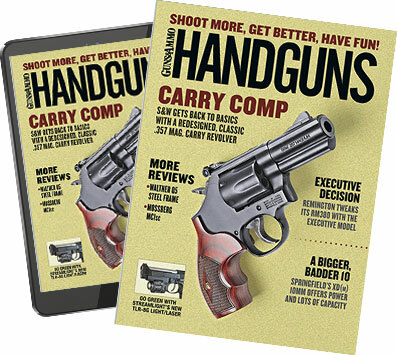 The most recent addition to the product line is being directed at the concealed carry market, which is ever expanding due to the number of states authorizing their citizens to carry concealed handguns. Combined with the large number of military, law enforcement and private-security personnel who also carry concealed, it makes a lot of sense for any gun manufacturer to have a model intended for covert carry situations. Unertl Ordnance has addressed this need with the Unertl Concealed Carry Pistol, or UCCP. In short, the UCCP is a Commander-size pistol with a 41?4-inch barrel that is manufactured to a very high standard. Unertl handguns are not inexpensive, but the company believes the prices are justified by the time and effort put into each gun. The UCCP comes with both long and short triggers. Director of operations Aaron Davis tells me, "We buy the best components that we can from sources all across the U.S. They must be American-made components, as we will not use anything other than U.S. parts. Once we have these--and they are not cheap--we build [our guns] one at a time using craftsmen who have been building 1911 pistols for 20-plus years. These guys know how to put a 1911 together and what it takes to make the best 1911 money can buy. Yes, Unertl guns are costly, but you won't find a better gun anywhere, including the top-end custom guns." Tim Beghtol, director of manufacturing, adds, "After building 15,000 to 20,000 1911s, you learn what not to do." Is a Unertl 1911 worth the price? Well, that would be up to the individual user, but I can say that the folks at Unertl put a lot of TLC into each gun. In the case of the UCCP, there are numerous features built into each model that cannot be ignored. Every part contained inside any Unertl pistol, including the UCCP, is either machined or EDM (electrical discharge machining)--no MIM (metal injection molding) parts are found anywhere. Unertl believes that MIM parts shorten the life and degrade the quality of any gun, and they will not be used. The rear sight was nicely serrated at 24 lines per inch--something the author prefers. The stainless steel barrel is match grade and can be obtained in either a heavy cone configuration or a standard barrel/bushing. The frontstrap is checkered to 24 lines per inch to offer a solid hold regardless of the conditions experienced. Ambidextrous extended frame-mounted thumb safety with a single side safety being an option. Extended beavertail grip safety with enhanced palm swell for positive engagement. Either a one-piece magazine well for faster reloads or a standard mainspring housing with no magazine well for reduced bulk. The option of a short or long match trigger depending on user hand size. All surfaces coated with industrial-grade Teflon S for corrosion resistance. The finish also offers enhanced lubrication properties. All edges rounded and contoured to ensure a snag-free concealed draw. Each UCCP pistol comes with four premium-quality eight-round magazines with base pads. In the case of my test gun they were Chip McCormick, but Wilson's are also used. A locking pistol case, a set of hearing protectors and a set of eye protection round out the accessories that come with each gun. Every Unertl pistol has a full five-year warranty that covers everything except obvious customer abuse. The frontstrap of the UCCP was checkered 24 lines per inch. Repelling an attack and keeping the owner alive is the primary function of a concealed carry gun, and to accomplish this task the gun needs to run without fail. The late, great Jeff Cooper once stated that a defensive handgun needs three essential features: good sights, a good trigger and total reliability. I would add that the gun needs to fit the end-user, but then the 1911 fits just about anyone regardless of hand size. People with large hands may want a long trigger. Each UCCP comes with a set of high-visibility night sights that are made by Unertl. Unertl offers these sights for a wide range of autoloaders, and I have these on several of my guns. I can personally attest to their durability and high visibility. On my test UCCP, the rear sight was nicely serrated to help reduce glare, and while many will say that this feature is not really necessary, I respectfully disagree. I have found that rear serrations help me focus more easily on the front sight. The trigger on the test gun was a crisp five pounds with a short and easy-to-control reset. There were no rough spots found anywhere in the trigger action, and such a trigger makes the gun easier to shoot. Without a doubt, the UCCP meets Col. Cooper's essential standards with no problems. A winter storm arrived at the deadline for the author's shooting test, so he used his gun club's indoor range to check the UCCP's accuracy and reliability. Reliability can only be evaluated by shooting the gun and doing so a lot. A few rounds fired for accuracy do not test a gun's long-term reliability. I am the first to admit that I cannot shoot enough in a simple test to truly test this either, but I did intend to give it a heck of a try. The winter weather in Ohio was brutal on the day of the test (seven degrees and snowing), so I elected to test the gun in my club's indoor range, which limited my testing distance to 50 feet. While it is nice to know how well a gun will shoot from the bench at 25 yards, such match-grade accuracy is not essential for a fighting pistol. In reality, shooting the gun off-hand at 50 feet is a much better test for a gun that will be drawn and used most likely inside seven yards. The UCCP liked the Hornady 230-grain TAP CQ ammo. Yes, I know--some will say that this is more of a test of the shooter than the gun, but I can assure you that I am not such a good shooter that I can make an inaccurate gun look accurate. I pulled together a collection of ammunition that is street proven and shot five-round groups off-hand at 50 feet. The results are shown in the accompanying chart. After a bit of practice, it was no problem to keep my groups inside the three-inch Birchwood Casey Shoot-N-C target dots, which tells me the gun is more than accurate enough for defense. The Unertl pistol functioned flawlessly with a wide range of hollowpoints. Be leery of sending off your 1911 pistol for accurizing, as it has been my experience that the tighter and more accurate you make a 1911, the less reliable the gun becomes. If the gun is for competition only, then such a modification is no problem. But give careful thought as to what it is you require from a personal-defense gun, and you will realize that the needed accuracy is not that great. I completed my test by shooting several hundred rounds of various hollowpoints through the gun, completing a number of El Presidente and Bill Drills. I used a Wilson Combat Tactical Assault holster for the testing, and, as with all Wilson holsters, the fit was flawless and the gun broke cleanly from the rig each and every time with no drag. The accompanying Wilson magazine pouch also proved to be a quality product. The break-open front pouch held the spare magazine solidly in place throughout the afternoon of testing but cleanly released the magazine each and every time. Note: Five-round groups fired off-hand at 50 feet. the test I just loaded seven rounds in this same magazine, and it functioned flawlessly. Some say that 1911 magazines should only hold seven rounds anyway, but that is up to you.